Tip: Drive up with the elevator onto the north tower with Pummerin bell or walk up the higher south tower and enjoy the view at the inner city. The Stephansdom Vienna (C3) with the famous Pummerin bell is a world wide known cultural possession and one of Vienna landmarks. The local people use also the name Steffel for this impressive cathedral. Several times a day worship services are celebrated and sometimes also weddings and requiems from popular people which are even broadcasted live on television. At such special occasions and at important church festivals the Pummerin bell is ringing. 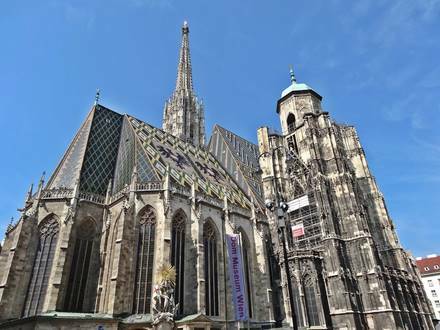 The Romanesque church St. Stephan in the heart of Vienna was consecrated in the year 1147. There were constantly redesigns and structural extensions which were influenced by different styles like late Romanesque and Baroque. In 1450 the construction of the north tower begun. 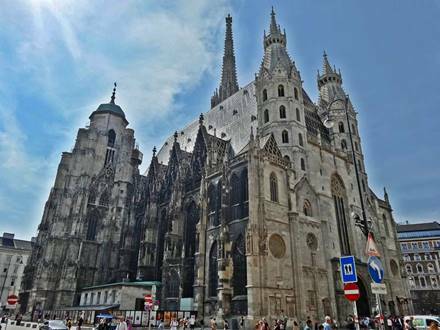 Hard times like the Turkish Sieges, fire blasts and wars didn't really damage the Stephansdom for more than 800 years until the last 2 weeks of the 2nd World War when the cathedral was burned to the ground. 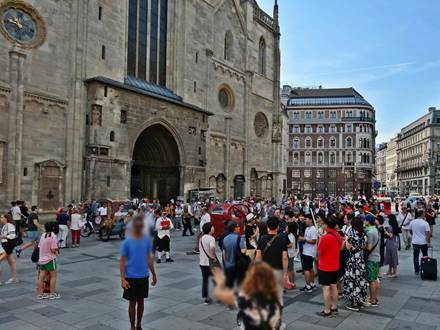 But due to the engagement and the love of the citizens to the stone popular landmark already after 7 years the Stephansdom was ceremoniously reopened and due to that it is also a symbol for the reconstruction of Austria after the 2nd World War. In 1951 the new Pummerin was casted in St. Florian partly out the material of the old bell which tumbled down at the fire in 1945. It was pulled up in 1957 onto the 68 m high north tower. The biggest and heaviest bell of Austria weighs 21.383 kg. 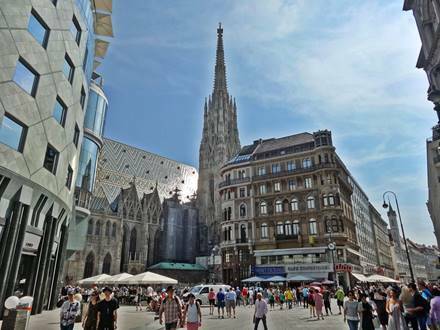 To reach the top room of the high tower, which is the 137 m high south tower and also commonly known as Steffl, you need to climb 343 steps.The cathedral itself is 107 m long and 34 m wide. The central aisle is 28 m high and the three choir halls are 22 m high. 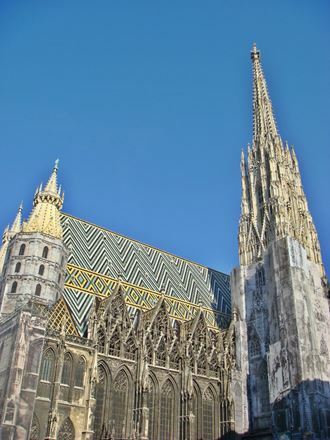 The cathedral of Vienna is definitely worth a visit. The entrance to this imposing building is free, but only some areas may be visited without paying an entrance fee. For the main area of the cathedral a guided tour by audio guide is available for around 6,00 Euro. At this tour you will see numerous art historical and architectural highlights like paintings, altars and sculptures. Both towers offer an impressive view over the city center. Of course you need to pay an entrance fee for this experience. The elevator onto the north tower with Pummerin bell costs approx. 6,00 Euro. For the south tower you have to pay only about 5,00 Euro, but you must tackle the 343 steps on foot. 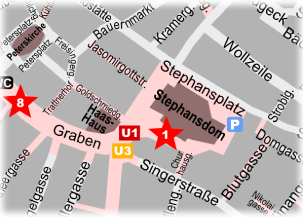 Who prefers to step downstairs instead of upstairs, can also visit the catacombs in a guided tour (approx. 6,00 Euro). In the Bischofsgruft you can find the urns of the Habsburger and the tomb monument for emperor Friedrichs II, which is made of red marble. You may visit all the tours listed above at a reasonable price with an all-inclusive ticket. This ticket costs around 14,90 Euro.